'Righteous kind' had quite a large impact on me. At the time I thought this EP to be so daring, full of brazen musical fantasy and above all extremely good. And still do. Actually I'm surprised that so little people picked the record up as Morgan Mecaskey ought to have made a name for herself in the past 18 months. To make such an impression again with a new record is near impossible. For that the expectations and the points of reference are set way too high. That does not mean that I wasn't pleasantly surprised recently to find that Mecaskey released a new EP in December 2014. In fact, the music I heard on her Bandcamp site made me extremely pleased with what I was hearing. Lover less wild is only a four song EP, but the quality makes me forget that it's only four songs. A lot is going on here. Some soul searching, deeply felt emotions escape from the digital realm on my player and the (layers in the) music follows suit. Again the music is rich, with a keen ear for details in the arrangements, kept small for extra effect, but full sounding and underscoring the atmosphere where needed, in a larger, expanding way. The album starts and ends with a short snippet of music that appears to have nothing to do with what comes respectively what went on before. A lone trumpet playing a few notes resembling the starting notes of 'Also sprach Zarathustra' and a harmonica followed by a male voice, "Awh, is that it?" and it is. More than enough, as all has been played, said and sung in what went on before. Just a small inkling that Morgan Mecaskey has a vision on and for her music and nothing may be what it seems. The trumpet is followed by 'White horse' a song that could be called Morgan Mecaskey's throw at fame. An obvious single in the vain of K.T. Tunstall in 2005, with a desert, lone sounding guitar twang plus the horn section that could have been lent from Belgian band TMGS. With an undercooled voice she shouts out "Sometimes I don't feel like who I really am". Undercooled but there's no mistaking the sincerity here. 'White horse' is the biggest sounding song I've heard to date by Morgan Mecaskey, she comes away with this song triumphant, "victorious", no matter what she sings in the lyrics. 'Fighting extinction' is a whole step back. Vast, empty spaces are suggested at the start of the song, with an eerie guitar sound like the wind playing with the shutters of a deserted house in the middle of nowhere. A much more complex song than 'White horse', pulled apart by a soulful bridge part followed by a guitar solo taken over by a sax solo. Things are being torn apart here. From fighting extinction to extinct it seems. Jealousy is not a state of mind that leads to sound advice in this song and usually life itself. This is a very beautiful song and built up in a superb way. +2 so far. The title song again takes the mood down after the explosive ending of 'Fighting extinction'. Not for long though. 'Lover less wild' is another song in which Mecaskey shows her skills in dynamics within a song. The 3.17 minutes takes you everywhere and back and never loses the focus on the song. 'Crushed' is the final song. A subdued song, again with a twang guitar in some parts, joined by a classical guitar interlude between the chorus and verse. Again the way Morgan Mecaskey can harmonise with herself sticks out. 'Crushed' remains a small song to the end. Lushly arranged in the somewhat Spanish/Mexican mood in the background. The surprise comes with a change in the chord progression of the acoustic guitar. The song takes a full swing into another direction. It looks like Mecaskey brought in all her friends to sing with her. She takes a step back and together they sing this intricate melody, with parts added the whole time, bringing a perfect ending to this EP. Except for the harmonica of course. At the end of the four songs there can be only one conclusion: Lover less wild is a beautiful record, with beautiful songs that are also full of class and quality. 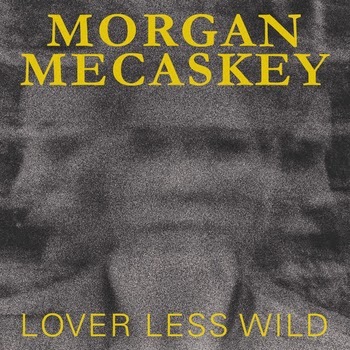 'Righteous kind' was a deep record, on Lover less wild Morgan Mecaskey jumped off the deep end with no life jacket nor anchor. She's going in for the whole dive, wherever the songs take her. Believe me, she's has done it again, leaving me behind in awe.